As cliché as it might sound, there really are not sufficient words to explain how amazing my time in Romania was. Brasov is a beautiful city, and the joy of working with the children just cannot be described. My time was full of so many extraordinary experiences, both in volunteering and sightseeing, and my trip introduced me to some of the most wonderful people I’ve ever met. Romania is such an amazing country, full of rich culture and beautiful scenery; it’s just in need of a little helping hand to continue its move forward. I signed up for six weeks volunteering with children in Romania, not really sure of what I was agreeing too, but I quickly extended it to nearly two months. To be honest, my time there wasn’t really what I was expecting – it was better. I tried my hand volunteering in a few different places. I spent the majority of my time working in the children’s hospital and helping to teach English at a school, but I also experienced volunteering at a family home for children with behavioural problems, a centre for those with Down syndrome, and I even got to work at a rural Hungarian school for a day! It was great to have the chance to assist in so many areas, but it really was the hospital and the school that I enjoyed the most. I worked in the Neuropsychiatry ward in the mornings, assisting with Play Therapy, which basically meant I got to play games with the younger children and just hang out with the older ones, many of which spoke reasonable English. I became a professional at Uno, Monopoly and a card game called Macaua, but most of all, the children loved to teach me Romanian, something I was more than willing to learn. In the afternoons, I taught English at a school, mostly in grades five to eight, but I also visited classes all the way down to the first grade. Just having somebody talking to them in fluent English made a dramatic difference to their learning, and I felt so appreciated when I walked into the classrooms and the children would excitedly yell my name. I looked forward to my time at the hospital and school every day, and no two days were ever the same! Although volunteering was the main objective of my trip, it was certainly not the only part worth mentioning. Living with other volunteers was definitely a huge benefit of the project offered by Oyster. I spent my days with some of the best people I’ve ever known, all coming together from every corner of the globe for the same purpose; to volunteer in Romania. The volunteers weren’t the only amazing people my trip introduced me to. Everybody I worked with in Romania was so friendly and welcoming, but it was the Oyster representative, Razvan, whose efforts really made the experience so unforgettable. Razvan’s tireless hard work to improve the lives of others and his never-ending generosity, coupled with his love of fun and perfect English skills meant we were always glad of his company. His assistance ranged from two minute check ins at the end of the day, through to taking us on weekend adventures or simply hanging out with us at the flat. His help and endless knowhow allowed us to see more of Romania than just what our project showed us. On weekdays, I loved my volunteer work; however, weekends presented us with a chance to view outside our routines. During my eight weeks, I journeyed to four other towns, experienced Halloween at ‘Dracula’s’ Bran Castle, climbed ladders over waterfalls, visited medieval fortresses and hiked mountains. 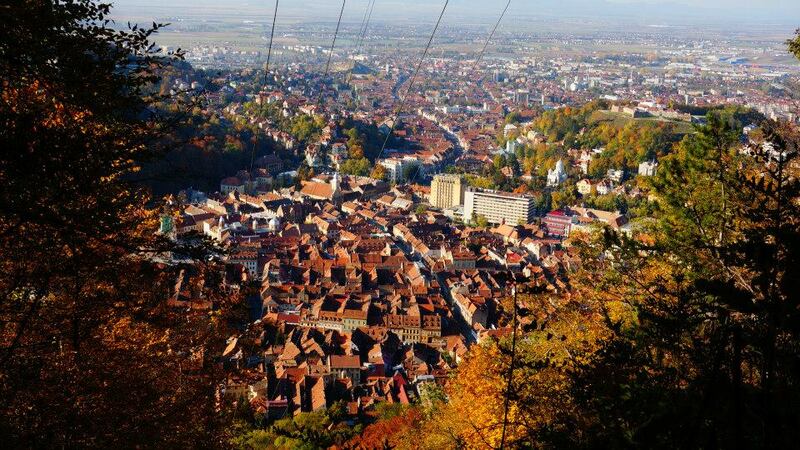 Brasov itself is a city with so much to offer, and was especially enjoyed in the company of other volunteers. We really lived in the town, establishing habits and knowing the best places to go for our needs. The local cupcake shop became our best friend, and we were always up for trying new restaurants. Leaving Romania was incredibly difficult. As I began counting down the days, I started to become aware of all the things I had become accustomed to that were unique to Romania. I am so grateful that I chose Oyster to volunteer with, and so glad I chose to spend my time in such a wonderful place. For a country that’s been through so much, it is often forgotten in the scale of the world, but I really believe that the progress Romania has made is incredible, and Oyster gave me a fantastic opportunity to see an amazing country that I might otherwise have overlooked. I can’t think of a way my time Romania could have been improved, and I look forward to my next adventure with Oyster.